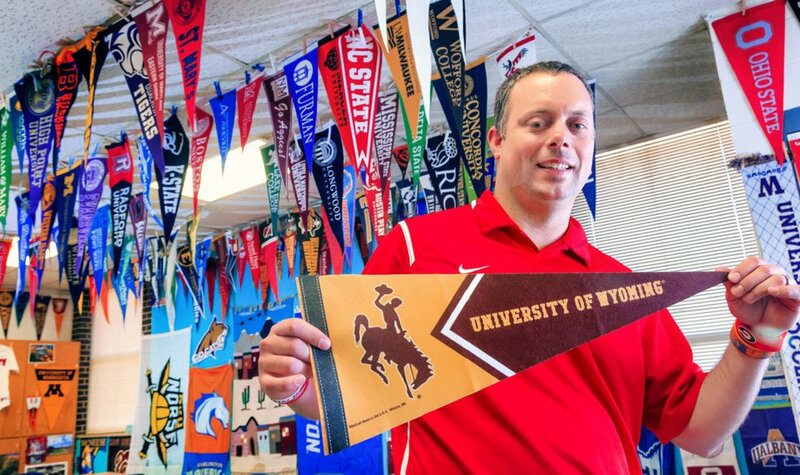 YUKON — Students who step into Daniel Griswold’s sixth-grade classroom are greeted by colorful pennants and posters from more than 300 U.S. colleges and universities. More mementos arrive in the mail each week. Griswold came to Yukon Middle School four years ago to teach geography, but wanted to do more for his students. Geography, he decided, was the perfect subject to promote the idea that education doesn’t end with high school. He recalled how Cesar Chavez Elementary School in Oklahoma City had decorated the cafeteria with college items, and began requesting anything that colleges were willing to donate. Griswold started emailing schools in alphabetical order. Three years later, pennants encircle the room three times and more hang from the ceiling. Large public universities and small private colleges from coast to coast sent stand-up displays, posters, pencils, stickers and lots of pennants. Griswold said the response was overwhelming. Some college officials even wrote letters of encouragement to his students. Students who never have heard of Austin Peay or EWU soon find out. “I use the information from universities and colleges in my lessons,” Griswold said. Maps of the campus, city and region are studied. Students research and write reports on a college of their choosing. Most hadn’t realized the grades that are required to get into college and the cost, Griswold said. That leads into lessons about scholarships and the importance of good grades and extracurricular activities. Griswold wants to impart that early, especially for students who don’t work hard and do their best. He uses the swag colleges send to reward their efforts. Students may hear about colleges that are nearby or the ones their parents attended, but Griswold gets them “to think about all the possibilities that are out there for them,” Lebsack said. It complements the middle school’s academic and career development activities. “Every eighth-grader leaves us with a college plan and a high school plan,” Lebsack said. This year, Griswold wants to work with the careers exploration teacher to help students find their interests and then research what schools are strong in that major. “They don’t see them as schools. They see them as teams,” said Griswold. To sixth-graders it’s all about the sports. As a child, he was enamored by Duke University and this summer he fulfilled a lifelong dream by visiting the Durham, North Carolina, campus. But when the time came, he went to the University of Central Oklahoma for its education program. Pennants of both UCO and Duke hang near his desk. When school begins Thursday, Griswold will welcome a new group of sixth-graders into his geography/college prep class.